Summer Style Me Pretty Challenge! I like the way the necklace pattern echos the pattern in the top..
F21 Linen Capris(sold out) and Natrulizer leather sandals I bought a few years ago completes my look..
As for the Red -Orange Dooney and Bourke, that was a gift from a dear friend! Have you ever thought, “No , not for me!” about a brand or style and then changed your mind? If so, chime in with a comment , this could be fun! I am grateful that I at least got some sleep last night (5 hours) and that my sinus issues and sneezing cleared up. I am grateful for a quiet day, just taking it easy..
3 Responses to "Challenge Day 10"
That’s a pretty top. I love all the colors. I’ve never shopped at F21. I did buy some things I liked at Wet Seal, which surprised me. I followed my daughter into the store one day. You are so on point with your summer outfit # 10. 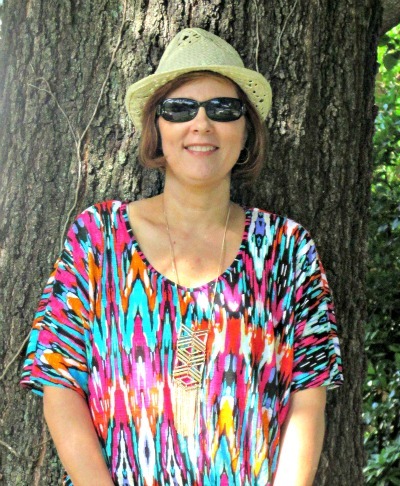 Love the bright colors in your top.